There are few things more frustrating than waking up hungry, in a new city and trying to pinpoint a great breakfast spot. Lucky for travelers, Utah’s capital city provides a number of tasty morning eateries. Business savvy travelers staying downtown will find the Market Street Grill open as early as 6:30 a.m., a perfect place to fuel up for the day. A restaurant originally known for its excellent lunch and dinner offerings, Market Street’s seafood-infused breakfasts (crab benedict, seafood omelet, etc.) is offered at a great price. If you’re looking for the “locals&apos; secret,” it’s got to be The Park Café. Located across from Liberty Park, this café always has a wait on the weekends and boasts a fun atmosphere. For those nursing a hangover, the café’s specialty hash is sure to improve your morning, or for the sweet tooth diner the French Toast Foolishness will not disappoint. Right up the road is Finns Café, originally opened in 1954 and known for their Norwegian Waffles. This well lit and dainty breakfast spot has an espresso bar, awesome omelets of the day and, in the warm months, a great patio. Continuing east up 1300 South will deliver egg lovers to their “eggvana,” Eggs in the City. An edgy restaurant nestled in a cozy neighborhood, their egg selection is killer (as you’d expect). If you’re into huevos rancheros or breakfast burritos, this is the place for you! For a more scenic breakfast spot, Ruth’s Diner is a must! Featured on Food Networks Diners, Drive-Ins, Dives, this restaurant, held in an old train car, opened in 1949. Located a short distance from downtown up Emigration Canyon, their mile high biscuits are the best in town. You literally can’t go wrong on this menu, though the Pecan Cinnamon Roll French Toast or Pulled Pork Benedict are favorites. Two additional popular breakfast spots in Salt Lake boast local and organic menu items. 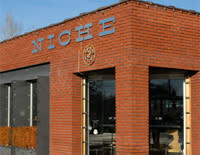 Caffe Niche has daily quiche, a talented barista and serves mind blowing homemade English muffins with fresh made jam. If jam is what piques your breakfast taste buds, Pig and a Jelly Jar features different jams every day, a variety of toppings for their waffles and serves some of the best chicken and waffles around. Many of Salt Lake’s popular dinner spots double as equally delicious brunch venues on the weekends. The Copper Onion cooks up a wicked steak and eggs and puts a fun twist to Bloody Mary’s with their bloody bull. Pago, located in the quant 9th and 9th area of Sugarhouse, offers house-made scones and $3 Mimosas and Blood Mary’s. 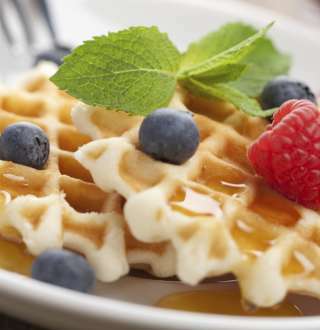 Check out the dining establishments below that offer breakfast or weekend brunch to add to your Favorites, or get our complete list of Salt Lake&apos;s dining options.